The much-admired trumpeter and flugelhorn player Harry Beckett died this afternoon after a stroke on Tuesday. His last gig was Big Band Britannia with Guy Barker's orchestra last month (Photo credit: Roger Thomas). The roll-call of bands he was in makes him a central figure of the 60s/70s British scene: Ian Carr's Nucleus, the Brotherhood of Breath and The Dedication Orchestra, London Jazz Composers Orchestra, John Surman, Octet Django Bates Ronnie Scott's Quintet, Kathy Stobart, Charlie Watts, Stan Tracey's Big Band and Octet; Elton Dean's Ninesense. He also toured with Charles Mingus. We were very sorry indeed to read about the death of Harry Beckett. An incomparable loss, personally and musically. 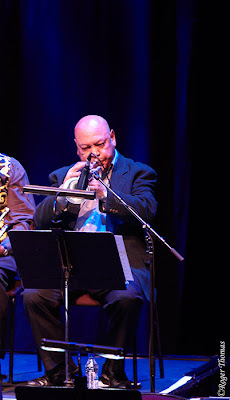 He was one of our greatest, and most distinctive trumpet players, and a totally committed jazz musician. We worked together a lot in the 60s and early 70s, especially in my orchestra. His solo on the last track of the Metropolis album is one to treasure. Thereafter Kate, I and Chris Biscoe often ran into him on the road, always a delight. Chris, of course, has been working regularly with Harry in small groups. At one point the two of them did a two-year stint with the Orchestre National de Jazz, in Paris. We are all going to miss him terribly. Harry was always a pleasure to play with, and always indicated to me that he enjoyed very much our gigs together. A lot of that was to do with own his undoubted good humour, encouragement and enthusiasm. We would always have a lot of laughs together, and I can hear his voice now saying "Hey Trev, how's it going," with a wry smile on his face. I'd always try and reply with some tongue-in-cheek remark, and we'd be having a laugh from that point onwards. He was a great player that found the key all musicians like us are looking for. The way to "get it on" every time he picked up the horn. He'll be sadly missed by many people. Not least of all myself. I was glad to have known him. Very sad. I loved playing with Harry Beckett. I lovely guy with a great feel, and totally his own thing going on. He was highly respected right across the scene, and will be sadly missed. He was a wonderful spirit and his playing encapsulated all that is great about the music. This news is so sad to hear - but what a great and truly original player. Mingus was absolutely spot on in rating him so highly. RIP Harry. Harry was a lovely guy, and tought my old man to play the trumpet. Now his music will continue from above. This is terrible news. He was a fantastic player of great warmth with a truly inimitable style. He will be sorely missed. What a great hero of British jazz. I discovered his playing with Graham Collier and Mike Gibbs while I was still at school, and met him on a short jazz weekend course run by Graham in the 1970s. He was a big influence on my writing in Landscape, and his album Flare Up is one of my favourites, along with Mosaics by Graham Collier Music, which has magnificent Beckett solos throughout. He once depped in my band (when we had a residency at the Troubadour) and I was in heaven, just listening to him play three feet away from me on the rickety basement stage. Many really good trumpeters still end up sounding a bit like someone else. Harry was always completely individual, and you could recognise his playing within seconds. He always made me smile, too, even in the context of quite serious or solemn music. What sad news. A lovely man. I saw him walking down Stoke Newington Church st last month but didn't get a chance to speak with him. I first met Harry in the early 60s when I was playing alto in London and we were often on gigs together. He was delighted when i told him that I was born in Trinidad, a fellow West-Indian. Then I worked abroad for many years and didn't see him again until sometime in the 90s. When he caught sight of me, there was no hesitation, a big hug and "Hey, my man from Trinidad!". That was Harry. No wonder he had countless friends and admirers, together with a sound that was all his own. God Bless You Harry! I miss you Harry and I will never forget the good time together with Didier Levallet. This is really sad news. Harry was indeed a national treasure. He had developed his own distinctive style whole remaining able to adapt to and shine in any situation as he was equally at ease playing free jazz, swing, electro-jazz, reggae or dub. I feel grateful to have played and recorded with him and miss Jim very much. Harry was one of the kindest and warm-hearted persons I've ever met. It was a joy to work with Harry all those years. And thank you for believing in me when others didn't and for giving me the space for creativity and being an inspiration. Harry was very special in any way and will be badly missed by all of us. As well as the serious side of playing music it's the dry humor and the fantastic laughs we had with him. No more funny phone calls at the wrong time of the day, it is truly sad. Go well dear Harry I'll miss your mischievous sense of humour but above all your playing. The sad news was waiting when I returned home after a few days away. My music owes so much to Harry that I can't imagine it without him being in there somewhere. If there was a jazz god he would have showered Harry with every prize imaginable. As there isn't we can just cherish his contribution. Which is immeasurable. Really sorry to learn of Harry Beckett's death. He was so much part of the UK jazz scene - I first saw him when he lead a group of jazz musicians at a school music lesson back in 1974! I was very sad to hear the news about Harry. I was very honoured to play with him with Graham Collier's Music in the early 70s. He lived very close to my parents' house in Newington Green and would often stop and chat with my father outside his photographic studio on the Green. He tipped me off when Ian Carr was about to call me to join Nucleus in 1974. He was a truly inventive player with a light touch and a great sense of humour which all contributed his unique style. Thank you all for the wonderfull comments about my father-Harry Beckett. We, his family did not realise how much he is loved outside of the home. Thanks again, his eldest child Cecilia. A lovely player. Present in ALL the recordings of the Brotherhhod of Breath, and so much more. A great loss just after the news of Willem Breuker's demise. Just heard about Harry and I am sad to hear he's no longer with us. Harry played many times down here in Bristol and on behalf of all jazzers in the city I pass on our regards to his family. A true gentle~man and a very humorous guy. we recently spoke about his latest project coming to the new club and when he phoned me and I answered, he replied..."err, umm..(long pause)"
Sad news. As well as being a wonderful distinctive trumpet player, Harry was also a very underrated composer of beautiful pieces whether the fiesty spanish-tinged 'Cry of Triumph', the bubbling 'Tomorrow Morning Early' or the elegiac 'Forgive 'n Forget' and many more. Like all members of the British jazz community (and beyond) I mourn very deeply the death of Harry Beckett. At the recommendation of drummer Trevor Taylor, Harry became my trumpet-teacher back in l971 and regularly I visited his Stoke Newington home thereafter - principally, to be honest, to hear about the British contemporary jazz scene from one of its most gentle and humanitarian stars. Harry would write down exercises for me, but I was more keen to talk to him than to play. So Harry would say 'are the exercises alright? '; I would say 'yes, I can play them' (frequently I couldn't) and Harry would spend the rest of the time patiently answering my questions about his years with Herbie Goins and the Nightimers, Chris McGregor's Brotherhood of Breath and his relationship with Charles Mingus. 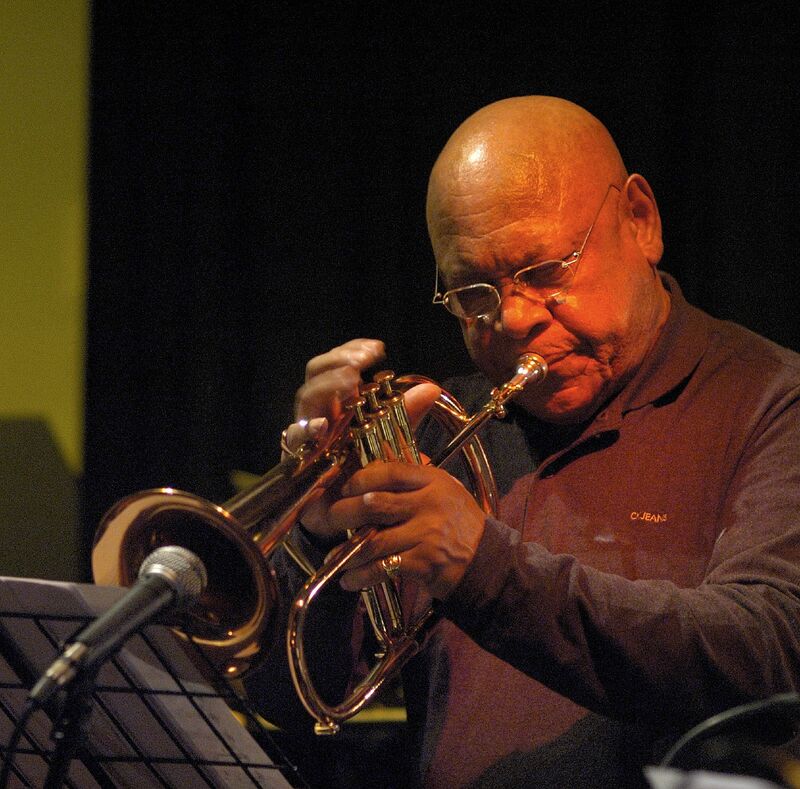 I'd first heard him on the great Graham Collier records including 'Songs for my Father' and - along with the rest of the contemporary jazz scene - instantly recognized a deeply original trumpet voice. The only player whose tone I could relate to Harry's own was (quite surprisingly) Jonah Jones who - on his later albums - had something of the same enclosed-focus approach to sound production. I remember mentioning this and remember that Harry kindly acknowledged the remark with a smile. Soon after he produced a dazzling solo album of his own (which helped place him at the top of the Melody Maker's annual trumpet poll) and a local group in Southend of which I was a part, invited him down to play the album with us. Unfortunately we only managed to learn one tune; a fact that Harry accepted with a shake of the head and typically forgiving smile before playing a far more ad-lib session. One memory in particular stands out. I'd visited Stoke Newington for my lesson and found Harry as usual greeting me at the door. After some time I noticed that he looked slightly pre-occupied and asked why. Harry told me that his son had been taken to hospital following (I think) a car-crash. 'Why didn't you ring me and cancel?' I asked. 'I didn't want to let you down' answered this most gentle and considerate of men. In later years I saw him principally at meetings of the Association of British Jazz Musicians chaired by Chris Hodgkins. As ever he was the slow-talking kindly and benevolent man who took life and people as they came and made little of his own outstanding musical talents. His loss is ours; an irreparable one, and I send my deepest condolences to his family and many, many friends. will miss you, all the best. . . I realised I took some pictures of Harry back in the 1980s - this one is from Edinburgh c1984, possibly with Dudu Pukwana's Zila. Harry was a great friend since many years....I remember well his visit here in Italy with Elton Dean during the Eighties to play with the Anglo-Italian Quartet. So many great dinner at my home to eat Italian food and have a lot of fun. All his records are masterpiece and some of his solos (suc as in Metropolis by Mike Westbrook) are part of the history of British jazz and modern jazz too. I was just playing Graham Colliers Down Another Road and was almost moved to tears by Harry's playing. Then I read about his death in a music magazine a few days later. Went back to listen to his solos again- you can tell what a warm human being he was from every note and phrase. This time I could not hold back the tears. Thank you Harry for giving us such great moments. I could be mistaken but I seem to remember somebody saying years ago(was it Robert Wyatt?) "whenever someone tells me about how great the latest new young band is I always go back and play some Harry Beckett"- that says it all really.